No crafting or crochet for me today!!! Took my son to the orthodontist, spent 15 minutes trying to get in the hospital car park. Saw the orthodontist only to be sent to the X-Ray department for x-rays of his teeth (he’s being assessed for braces by the way). Spent 25 minutes waiting for x-rays so decided to ask (politely I add) the receptionist if she had an idea of how long we would be waiting only to be told…………wait for it cause this is good……………”we hadn’t been booked in!” Well that wasn’t the response I expected. Think she saw the look of horror on my face as her next line was “I’m busy”. “But I’ve been waiting 25 minutes” was my reply. And hers, and this is another corker “Well I haven’t just been sat here doing nothing”. At that point my jaw hit the floor and I was rendered speechless. She then gave our slip plus a pile of others which she hadn’t booked in either to one of the health care assistants for them to book in. When we had finally finished it took us 40 minutes just to get out of the car park. And we have to do it all over again in 9 months time – woooo flipping hooo. Hence I have not had time to do any crafting today. I did make one ear for my chihuahua last night. So for today I will share one of my 2014 makes. 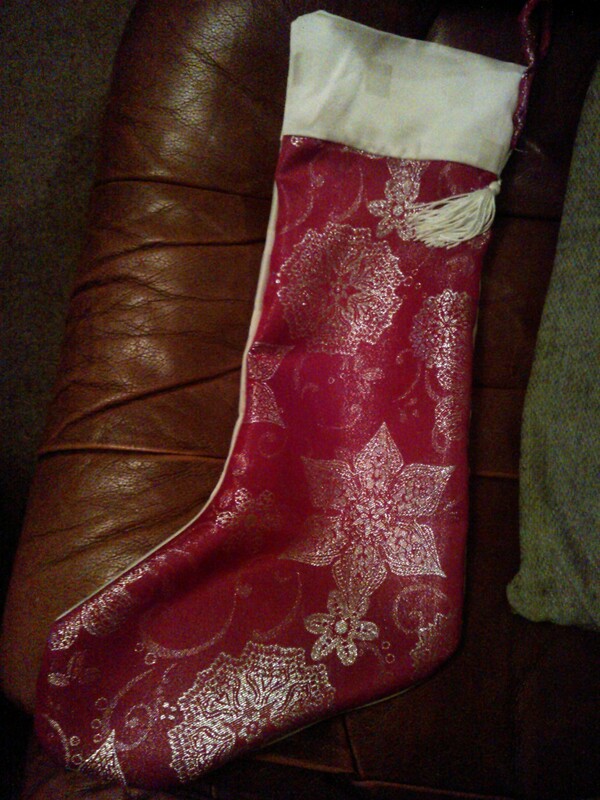 I went to a craft class and made a Christmas stocking. They were so easy to make that I made two like the one below for my daughter and her boyfriend for her first Christmas in her new house. As it got closer to Christmas I started to think about making some homemade crochet decorations. I made various small tree decorations include an angel which was very cute until I sewed it’s eyes on and then it took on an alien life form. 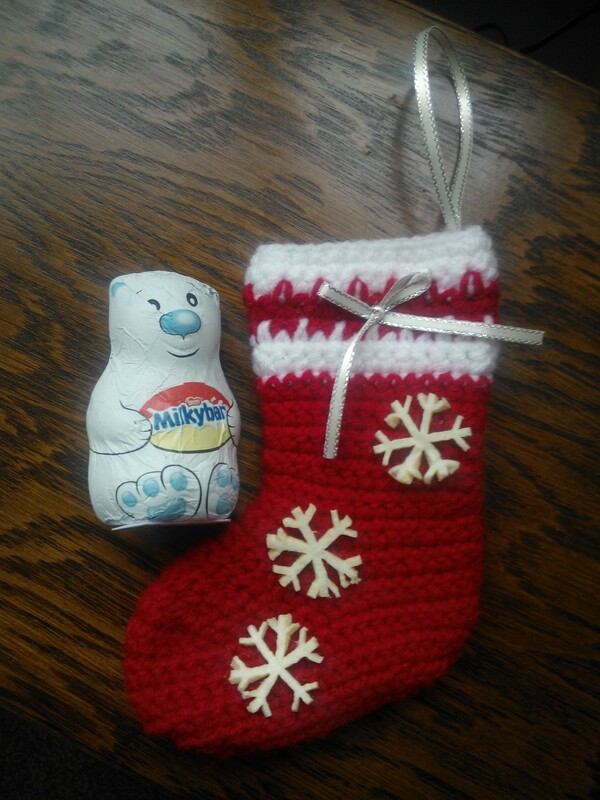 I made these small Christmas stockings to hang on the tree and popped a small piece of chocolate inside. I made these in a variety of colours – pink, purple, blue, green – all colours seemed to work really well. Each of my neices and nephews and my friends kids were all lucky recipients.